Do you ever look around you and think you’re the only one making any sense? Or tried to reason with your partner with disastrous results? Do long, rambling answers drive you crazy? Or does your colleague’s abrasive manner get your back up? Do you ever get the feeling you’re surrounded by idiots? You are not alone. Swedish behavioural scientist and runaway bestselling author Thomas Erikson is here to help, and will inform and entertain you in equal measure. 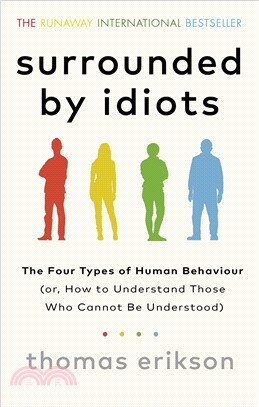 Available in English for the first time, Surrounded by Idiots, presents his simple model based on four personality types (Red, Blue, Green and Yellow). When you understand the psychology of each you can adapt your communication style to handle anyone more easily and get the best out of the people you have to deal with – be it at work, in public or at home. Thomas Erikson guarantees that after reading this book the number of idiots around you will be drastically reduced and you will have a better understanding of everyone around you. With a bit of luck you can also be confident that the idiot out there is not you!